Early this morning, while reviewing today's starting lineup for our team, I felt the need to create a stir. So, as we periodically do, we went back to "Good Friends", and our photo went from being a smiling Chris Young, to that of a smiling Yuniesky Betancourt. No, Yuniesky is not a full-time member of "Good Friends". His career OBP is abysmal, and there is negligible power or speed reflected in his HR and SB numbers. 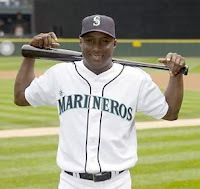 Last night, however, we awkwardly & silently answered a few of the questions from our last, embarrassing post, by dropping the highly touted Luke Hochevar and for the Mariners' Shortstop from Santa Clara, Cuba. Hochevar certainly did not have everything clicking in his season debut Tuesday night. His 8 earned runs in 2 innings were extremely embarrassing for us, especially considering that this probably won't be his last chance with our squad. Why can't we stay away? Will he "figure it out" and be good? Or, will Luke Hochevar take us down the same disastrous path we meandered through with Daniel Cabrera three seasons ago? It has come down to this. With Alexei Ramirez's day off, we chose to gamble on Yuniesky Betancourt having a fluke day in Texas' bandbox stadium. Aside from Yuniesky's perpetual drawbacks, he does have a few things going for him. This is a day game, and my guess is that the ball travels even better in day games @ Texas. He is facing a lefty. I actually checked yesterday, and he's better versus lefties. Again, it's @ Texas. That's really it. We like guys who hit @ Texas, with the strong side of their splits pitching especially. Yuniesky has been struggling and was just benched, but we feel that players often come back hot from situations like this. Anyway, it is just one game and the best news is that we now have carte blanche to pick up anyone we want, with no remorse because we are dropping Yuniesky Betancourt. Before we get into the cooky fantasy strategies that will direct our waiver requests for tonight, I'd like to briefly discuss a couple of managerial ejections that occurred last night. Blog favorites Jim Leyland and Ozzie Guillen had contrasting dust-ups with the homeplate managers. In Leyland's case, he came to the defense of his player, Magglio Ordonez, who was arguing a called 3rd strike. As can be seen in this video: Leyland objects to contact made by the home plate umpire, Paul Schrieber, when he places his hand on Ordonez's back to gently guide him back to the dugout. Leyland probably could have let it slide, but he brings up a good point that if a player cannot touch an umpire, then the umpire should not be able to nudge a player. Complaining about umpiring inconsistency is usually the most tried and true way to get your point across, but my favorite part is "I was here to protect baseball." Looking back at the rotisserie world, let's examine ten guys we are considering to replace Yuniesky Betancourt. As a reminder, Free Agent pools differ greatly from league to league, and we are in an 11-team OBP league. To that point, we will also look at ten guys of interest who are owned in less than 50% of ESPN 10-team leagues. Randy Wells, SP, Chicago Cubs: This guys would probably only be on the team for a day because his job in real life is not very secure, but he is starting for the Cubs tomorrow. He pitched well in his first game, replacing an injured Carlos Zambrano. He went 5 innings, gave up no runs, on 5 hits, 2 walks, and 5 strike outs. He gets a home start against the Astros tomorrow, so a Win is possible. We're going to decide to stay away. Eric Stults, SP, LA Dodgers: Stults has had some success this season, going 4-1 with a 3.58. We decided to stay away when we saw a Minor League career 1.50 WHIP. Mat Gamel, 3b, Milwaukee: This guy has expectations. He is the Brewers top offensive prospect. We need to make a claim for him because we are in a keeper league. I'm not sure how long he'll stay with the Brewers, but we will gladly get cut Casey Blake for him. Chris Coghlan, 3b, Florida: Mr. Coghlan is going to get a long look, versus RHP, with the Marlins. He has some power and some speed, and he will have multiple position eligibility because they will be playing him in the Outfield. We have a claim for him, where we will drop Casey Blake (if we don't get Gamel). Takashi Saito, RP, Boston: We have an RP position that isn't being used because Soria is on the DL and we haven't found a replacement. I don't want to drop anyone but Betancourt for this guy, but we have a backup claim for him in case others in our league pick up Holland and Coghlan before we get a chance. Shane Loux, SP, LA Angels: Word just came out that Shane will be moving to the bullpen. Pretty soon, I won't have to write anything other than SP/RP to explain why we're considering adding someone. The moment of consideration for Shane Loux has basically passed after looking at his less than stellar stats. Ryan Perry, RP, Detroit: Here is another guy that we will consider in place of Saito. I actually think I prefer Perry because we already have Daniel Bard in Red Sox middle relief. Does it make sense to corner the market on Papelbon understudies? Probably not unless you also get Manny Delcarmen. Looking at some of the numbers, we see that Perry has difficulties with WHIP his whole career... even in college! I guess I don't prefer him to Saito. He's off the list. Nolan Reimold, OF, Baltimore: This is an exciting Major League debut, since Reimold's Triple-A slash numbers are an otherworldly: .394/.485/.743. We aren't hopping on the bandwagon, yet, because he may be a back up if Felix Pie gets another shot to play everyday and Adam Jones comes back from his hamstring tweak. This article, on Reimold, includes encouraging notes on George Sherrill... Left-hander George Sherrill hasn't allowed a run in four appearances since his last blown save May 2. He has two saves in that time. Chalk it up to a tweak in his mechanics and a little old-fashioned motivation. Sherrill said he worked with pitching coach Rick Kranitz to close his body a little more when he comes to the set position, which has helped him get his arm into a higher slot and better finish his pitches. -- snip -- Sherrill also acknowledged that he was somewhat fueled by Trembley's decision to temporarily remove him from the closer spot he held for all of 2008. "I'm glad George is motivated. He has pitched better," Trembley said. "I'm hoping we have more save opportunities. We'll see where it goes from there. But I would agree; he has pitched better." Luke Hochevar, SP, Kansas City: His next start is at home versus the Orioles, which isn't the world's scariest match-up. That would have to be his last chance, at least for a while if he failed against the O's, right? Russell Branyan (48.4% ownership): We have never endorsed a guy like Russell Branyan. I really hate the way he would hit a few homers in bunches, while constantly striking out. I would hate him on my fantasy team or real-life team. As Melvin Udall could say, "I'm using the word 'hate' to discribe the way I feel" about the way Russell Branyan would play. Still, if the eye-training program he's on improves his chances to see the ball, maybe he'll be valuable. Elijah Dukes (37.8%): We love guys like Elijah Dukes. He's a former super prospect who looks like he is big, strong, and fast. From what I hear, his problems are with his attittude and his defense, but if he keeps hitting the ball, he will continue to play and produce for roto teams that don't take defense into account. Edwin Jackson (36.3%): I was shocked to see that Jackson is owned in such few ESPN leagues because we've been high on him since the Tigers traded for him. We love pitching projects that Leyland gets to "fix" in a Dave Duncan sort of way. Anyway, my shock subsided, when I saw his WHIP the last three years was 1.84, 1.76, and 1.51. Is the change of scenery and new coaching enough to make him a consistent ace? I think he's good. Juan Pierre (31.8%): He needs to be owned for the next 40-something games. This guy has a lot of pride and will play at the top of his game, while he knows he has this limited window to show what he can do. Pierre is known around the league as one of the hardest workers. He gets the "first to show up, last to leave" tag thrown on him a lot. I think there is no surprise that he has started off red hot since Manny sat down and he'll continue to hit for a high average, score runs, and steal bases. Ubaldo Jimenez (29.4%): According to Fangraphs, Ubaldo Jimenez had the fastest average fastball speed of any starting pitcher in baseball last season. His sharp performance the last three times out give us confidence that he can have a solid season. One should tread lightly, as there is great risk with the mysterious Ubaldo Jimenez. Dexter Fowler (25.8%): Another Rockie who should be owned in more leagues is their starting Center Fielder, Dexter Fowler. Here's another guy who may be fooling me, however. Again, he looks great. (Not in that way.) He just looks like the kind of guy who has scouts drooling over his combination of size and speed. Best case scenario, he becomes a Devon White, Mike Cameron, Matt Kemp kind of guy. Worse case, he becomes something between Chris Young and Corey Patterson. Tommy Hanson (7.4%): Our managing style, sometimes to a fault, leans towards youth and potential over experience and stability. It can cost us, as we pass on consistent producers for the upside of the unknown and a potential breakout. The buzz around Hanson, however, is unmistakeable. He is dominating in Triple-A. The biggest risk with having Hanson on a roto roster was whether they could carry a guy doing nothing for the first 6 weeks of the season. Well, since we are in mid-May, that risk has basically gone away. It's time to stash this guy who, barring injury, will be up in the next three weeks. Ian Stewart (7.0 %): I think stashing Ian Stewart away is sort of like shorting a stock in Todd Helton. Do you think Helton can avoid the DL this year? How about the struggling Garrett Atkins? Is there really a second baseman on the Rockies who deserves to play over Stewart? Ian Stewart's time is coming, and it's coming sooner than 93% of ESPN fantasy baseball players realize. Emmanuel Burriss (6.3%): this guy's stock rose in my opinion when I saw that he was a top 40 pick in the 2006 draft. He's also recently been appointed the new leadoff man for the Giants, as Frederic Lewis has been dropped in the order. Burriss certainly has the speed to stay at the top. If the tools that made him a top 40 pick in the draft develop in tandem with this opportunity, he can become a jewel to play at 2b/SS. Clay Buchhoz (2.0%): Another farm hand that is just going to take up some valuable roster space, right? Well, he has a no-hitter on his resume, an outstanding offensive lineup and bullpen waiting for him in Boston, and he is dominating in triple-A. So, I say yes, he's probably someone to begin to consider highly. Note: while we were writing this, the starting lineups for the Mariner's game came out. Yuniesky Betancourt was benched again. Typical. The best manager umpire run in of all time involved no words and no ejections.